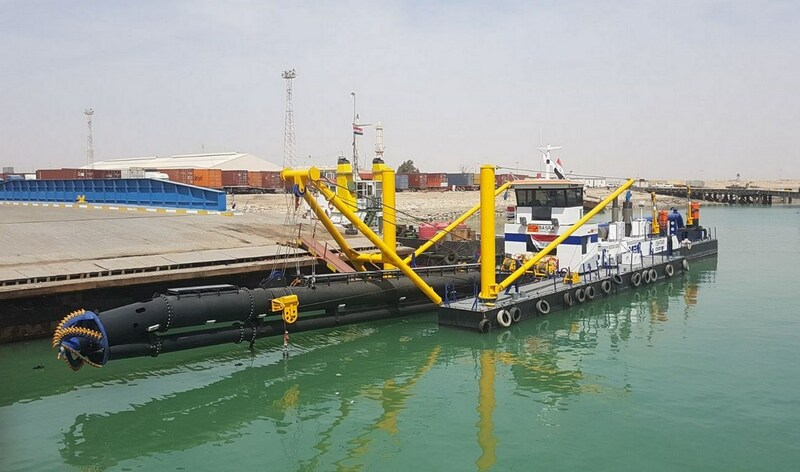 Home › Cutter Suction Dredger › Cutter Suction Dredger 500 › Cutter Suction Dredger 500 "Ishtar"
Recently, a customised Damen Cutter Suction Dredger, type CSD500, has been named by her owner Basra Gateway terminal at the Damen Dredging yard in the Netherlands. Immediately after the ceremony, the dredger was made ready for transport and towed to Rotterdam, from where it was shipped to Port of Umm Qasr, Iraq. The dredger’s first job will be the port extension for Basra Gataway Terminal. The CSD500 will work on the extension project of the Basra Gateway Terminal, at the Port of Umm Qasr, Iraq. The terminal operator, International Container Terminal Services, Inc. (ICTSI) has started an ambitious port enlargement project. This port expansion has now reached the second phase, starting on deepening of the container terminal using the CSD500 Ishtar. It total some 400 metres of quay wall will be added to the port capacity.